What better day to talk about fake news than April Fools’ Day? On Monday, April 1, four University of Rhode Island history professors will present the discussion “Fake News: A Historical Perspective” from 4 to 6 p.m. in the Agnes G. Doody Auditorium in Swan Hall, 60 Upper College Road, on the Kingston campus. While the term “fake news” has come into wide use since the 2016 presidential election, the forum will show that fake news – whether as a means to further a political agenda or cast doubt on the legitimacy of a news report – may be as old as news itself. The forum also highlights the value of history in combatting fake news, says Catherine DeCesare, a senior lecturer in U.S. and Rhode Island history. During the event, each professor will look at fake news as it relates to their area of study. Rollo-Koster will discuss the use of propaganda in justifying the first Crusades in the 11th century and, a millennium later, the war on terror, while DeCesare will focus on the intersection of fake news and Rhode Island history. Rod Mather, history department chair and professor, will address fake news and shipwrecks, and James Mace Ward, a senior lecturer who specializes in modern European history, will discuss the polarizing legacy of Jozef Tiso, a Slovakian president and priest who was hanged for war crimes after World War II. In times of political or economic crisis or war, says DeCesare, there is an underlying fear within the community that often results in increased negative propaganda as a political faction tries to hold on to or consolidate power. In the early 1840s, for example, the Law and Order Party was formed in Rhode Island to battle the expansion of voting rights and citizenship to immigrants, she says. At the time, large numbers of Irish immigrants were settling in the state. “Broadsides, newspapers, speeches and sermons were used in the past to control a message,” she says. 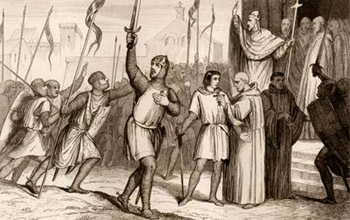 In 1095, Pope Urban II’s tool was the sermon in calling on European Christians to take up arms in a righteous war against Muslims, says Rollo-Koster. In the late 11th century, Byzantine Emperor Alexius I sought help from Urban II when Seljuk Turks were threatening the Byzantine Empire. The Turks, Sunni Muslims, had taken control of parts of the Holy Land, now the Middle East. In a volatile sermon, Urban called for Christians to reclaim the Holy Land, saying it was God’s will and claiming that Muslims were committing atrocities. Rollo-Koster compares Urban II’s rhetoric with President George W. Bush’s claims of weapons of mass destruction to justify the invasion of Iraq in 2003. “Urban II uses all of this exaggerated rhetoric,” she says. “Then you have Bush calling the war on terrorism a crusade. The rhetoric is the same. Bush says there are weapons of mass destruction. The weapon of mass destruction for Urban II in 1095 is the claim that Muslims are killing, roasting and eating babies. 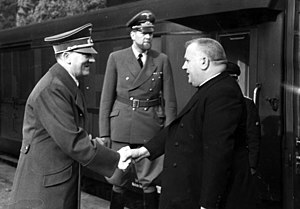 The story of Jozef Tiso, leader of the Nazi satellite state of Slovakia during World War II, highlights the use of fake news by competing political ideologies, says Ward.